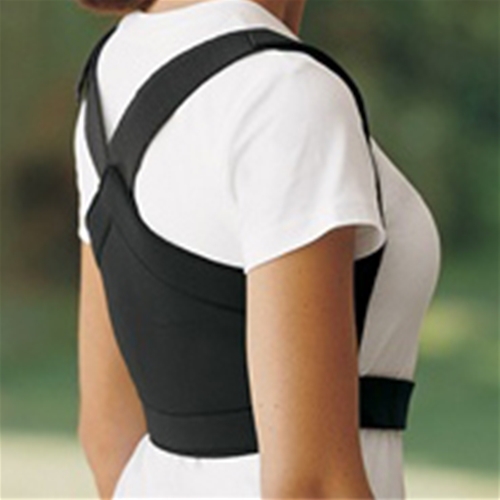 EquiFit Shouldersback Posture Support from HealthyKin.com is a vest-like posture support that gently pulls your shoulders back to improve your stance. The Velcro straps make it flexible and adjustable and the state-of-the-art fabric is breathable and washable. One set of straps fastens just under the chest. The suspender straps that come diagonally across the shoulders can be adjusted to increase or decrease the tension and corrective force. Wearing ShouldersBack for just an hour a day will help retrain your mind and muscles to support your back and stand taller. But feel free to wear it as long and as often as you like – at home over your favorite tee or on the road under a suit jacket or sweater. ShouldersBack is invisible to the rest of the world. All they'll see is your good posture and the confidence that goes with it. Our ShouldersBack Lite is made from PowerMesh, a soft sheer variation on the original. It was developed in response to our fans who want to wear ShouldersBack comfortably, even in the heat of the summer. Lightweight and flexible, ShouldersBack Lite trains your mind and muscles to keep a taller stance even after you slip it off -- just like the popular original. ShouldersBack is sized according to the circumference of the rib cage just below the chest. Please select your size accordingly. The chest straps should fit snugly without binding. The suspender straps are adjustable to fit individual body types accordingly. It works well but you need to wear it over a shirt or it is going to cut into your arms. If you are a normal sized adult purchase medium or large. I am 110 pounds and the medium fits well although there is room to adjust. I received my order on time and started wearing my Shoulder and Back support so far for past 7 days. Sometimes I didn't wear it that long even though it fits me good. I got the adult medium black. Its not noticeable and I can wear it as long as I want until the straps start feeling uncomfortable. I will continue to wear it and see how it goes 'cause I'm just 24 year old and dealing with back and shoulder discomfort since maybe about 10 years now so I have to retrain my back and shoulders to hold correct posture. noiticed it working right away! I am finding that shoulders back is a good support. I have had some shoulder and back issues that cause me to round my shoulders. With this, I am able to get my posture correct and it helps to retrain me. It's especially good at the end of the day when I am tired, in the morning before work or notice that I am slouching. I am happy that I got it. I can only wear it for short periods of time, unfortunately, because it cuts under the arms. I wish there were some way to fix that. Works well. Had to wear it over a shirt or it was a bit uncomfortable, but on top of a shirt works very well. Keeps me reminded to sit up straight with my shoulders back. I'm very happy with the product! It feels so good to wear it and felt it was helpful once I learned to put it on correctly. The velcro straps kept attaching to each other but after a few times, it was easier to put on. It even felt comfortable for a while wearing it without a shirt under it but it is better with a shirt under it. Works well. Little uncomfortable under the arms. Received Equifit quickly and started wearing immediately. It is helpful with my posture and usually wear average 6 hours a day. It is more comfortable overa tee shirt. The arms cut into my underarms. I have white medium and weigh 125 and medium is perfect. I recommend this product. Keeps me conscious about keeping my shoulders back and head up. Really does gently hold shoulders back, but definitely wear a shirt under it for comfort. You shouldn't rely on it for good posture, it's a tool to help you get in the habit of having good posture.